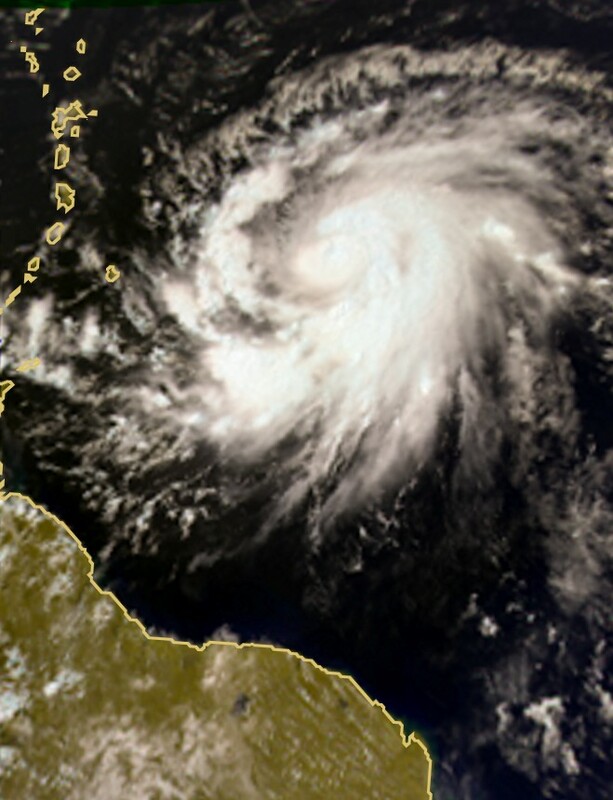 The first satellite image of Dean on 16 August in natural colour gives a good idea of the hurricane’s extent, but not its depth. It also highlights variations in cloud cover density, albeit imperfectly. Data in false colour will give a clearer picture. To map cloud density fully, scientists measure what they call the “optical thickness” of clouds. In other words, the denser clouds are the more of the Sun’s light they reflect back into space. Parasol excels in collecting this crucial information. 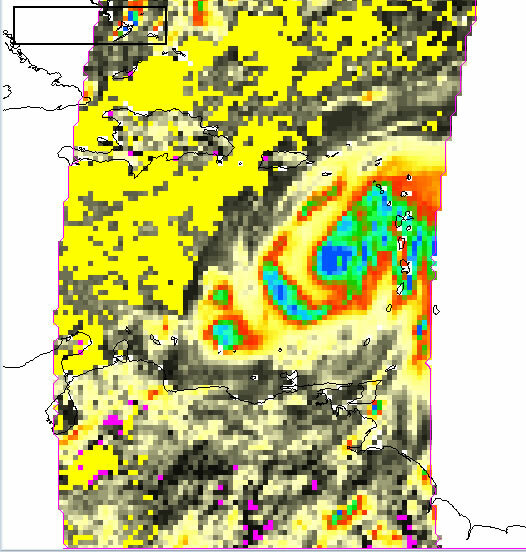 The wide variations in cloud water content exhibited by Dean are striking and much more clearly visible than in the natural-colour image. At this stage, we still know nothing about the clouds’ composition. Are they mainly liquid water or ice? 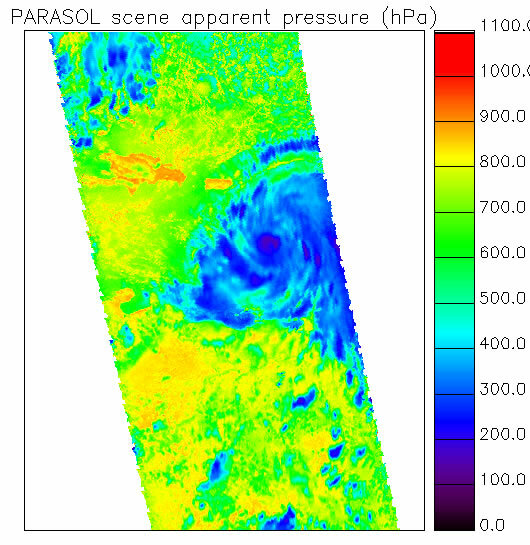 To find out, Parasol trains its “third eye” on the hurricane to see how light is polarized by the different particles reflecting it. 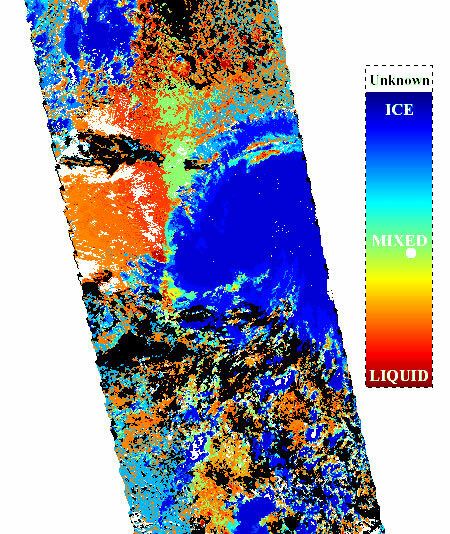 By comparing these polarization measurements with data from the MODIS satellite-borne instrument, we obtain an image that shows precisely the state of water at the top of Dean’s clouds. Although the hurricane is over the Tropics, most of the water is ice (in blue). Why? To answer that question, we need a map of “apparent pressure” at the cloud tops. Of course, Parasol doesn’t measure pressure using a barometer, which would be useless at an altitude of 700 km. But its sensing channels allow it to “see” the amount of oxygen present in the cloud tops. The amount of oxygen is directly correlated to pressure, and therefore to the altitude. This image reveals a pressure of around 200 hectopascals, which is very low (the mean pressure at sea level is 1,015 hectopascals). This allows us to estimate a cloud height of 12 to 13 km. At that height, with temperatures in the region of –50°C, it’s no surprise to find so much ice at the top of this tropical hurricane!